The Seasonal Simplicity Home Tour series is back; and this time we’re all about simple summer decor touches! All week long, my talented blogging friends and I are sharing part of our homes. I can’t wait to take in all the gorgeous inspiration! Thanks so much to our friend, Krista from The Happy Housie, who is hosting this tour and getting us all together. I recently shared my first Summer Tour HERE, which included my Living Room and Kitchen. Today I wanted to share with you how I made simple changes to give my Master Bedroom a summer refresh! Last year back in Dallas before building our home here in the Pacific Northwest and moving across the country, our master bedroom looked like this (read all about it here). We kept the bedding and some pillows and we still love our headboard and bench but I was convinced I wanted to do something totally different in this new home. But guess what? I’ve been looking and thinking and I really don’t know what I want to do yet. 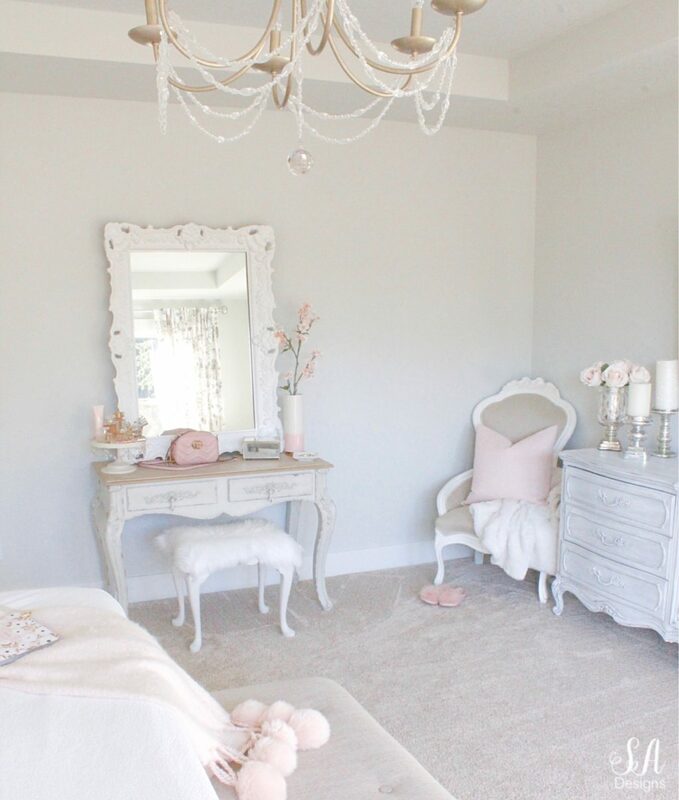 So instead, I’m finishing other spaces in our home first and I decided to just give our master bedroom here a “summer refresh” and change a few things. It’s easy! You can do it too! Here’s what I did in this home. Instead of keeping our ivory down duvet cover on the entire bed, I folded it down and kept it just at the foot of the bed for a cooler night. Since the temperatures are now warmer, our fresh crisp sheets and white ruffle coverlet seem just perfect. 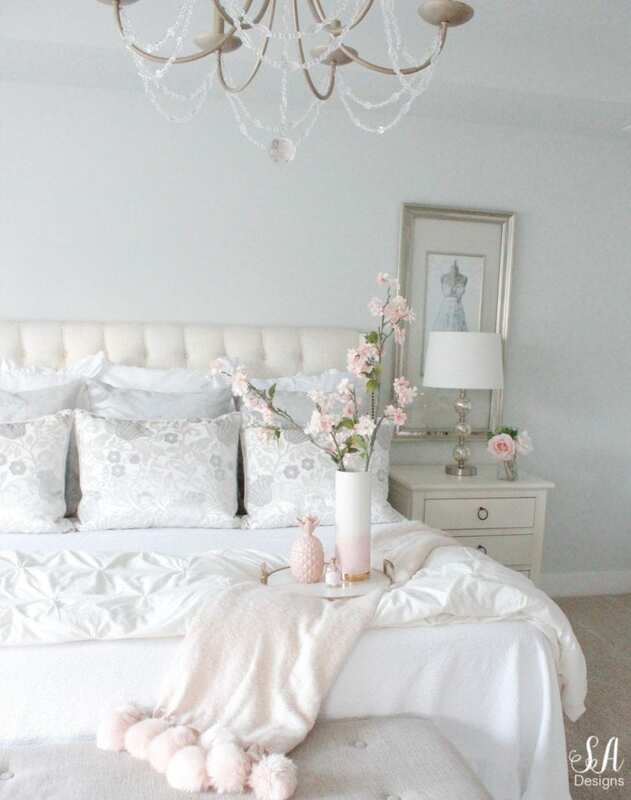 I also like the way the white linens and bedding brighten up the room. Tip: Mixing whites and creams are absolutely OKAY to do! I love the way it gives the room more sophistication and looks lovely, layered together. DON’T add just one pop of cream in a room or it might appear “dirty”. DO try to balance the whites and creams. Our last nightstands were vintage finds from our days back in Waco, Texas. I wanted some nicer pieces that were more functional and had cleaner lines and more contemporary drawer knobs or pulls. 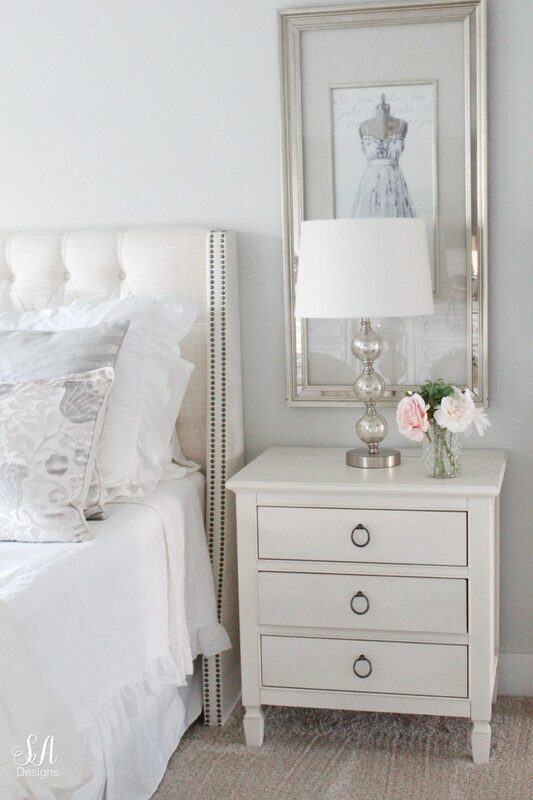 I was so happy to partner with my friends at Universal Furniture on these gorgeous Summer Hill Nightstands. I love the size, as I wanted large nightstands that could be great for storage but beautiful too. I love the ring drawer pulls and traditional style! It’s exactly what I had in mind. 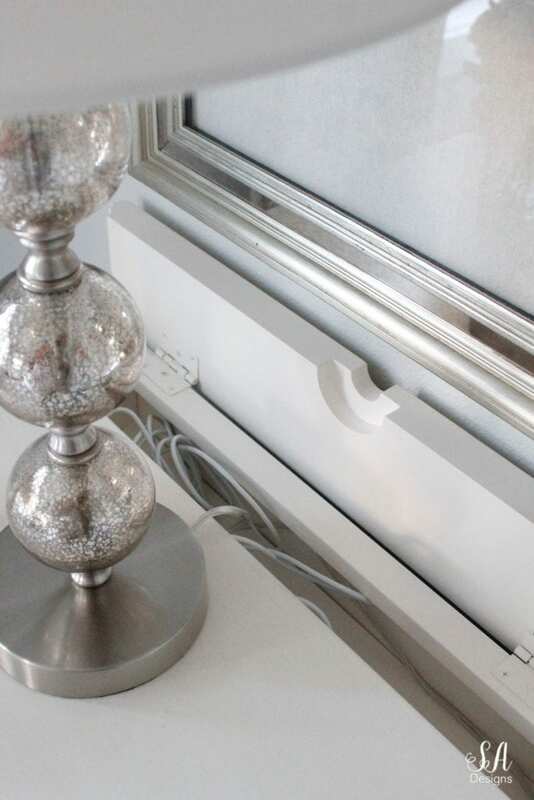 I love the ease of the drawers AND I absolutely love…..
…..the smart feature! I love that it has a lift top and a power outlet inside for 3 devices. I plug in our lamps and our mobile phones and there’s room for one other thing so I like that I can plug in my laptop and no longer have to plug the laptop on the side wall. Josh may have tripped on it a time or two in the middle of the night, eek! Universal Furniture makes such high-quality furniture and I’m so thrilled to have their pieces in my home! I highly recommend these nightstands. Josh and I are both so happy with them and they look perfect in our master bedroom. 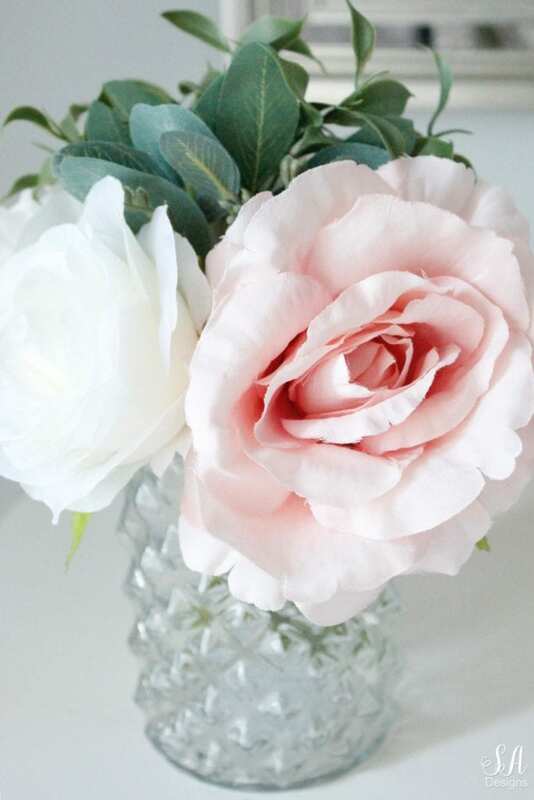 I love using both fresh and faux floral in my home. Since I have all fresh flowers downstairs and also up here in my office, I decided to stick with a cute faux bundle I found at Michael’s Craft Store recently and put them in these little glass candleholders that seemed perfect for vases (I loved the gold rim). I’ve recently partnered up with Perigold as a Tastemaker to share with you their gorgeous high-quality pieces that they offer from the design world’s top brands. I’ve found loads of fabulous home accents, art, textiles, furniture and more but I’ll share all of those fun finds with you over the coming weeks. 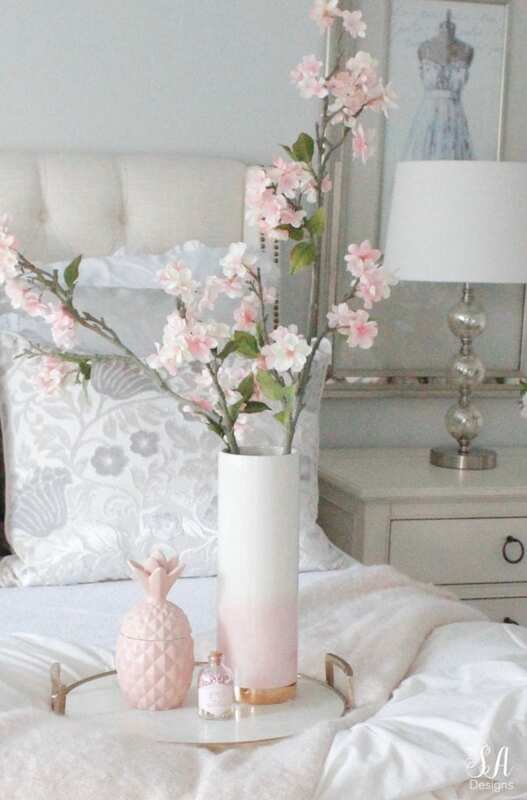 For my master bedroom summer refresh, I chose this gorgeous Legend Of Asia Spenser Table Vase for a pop of blush for the season. Anything ombre always catches my eye and then that gold base stole my heart. I love blush and gold together. I knew it would be perfect with some of my faux blush cherry blossom stems that I had on hand. With a pretty pineapple candle that smells absolutely DIVINE and some pretty pink matches, it seemed like the perfect touch of “summer” on this tray for my bed. For another pop of color and also because I didn’t always want to use the heavy down duvet, I chose my blush pom-pom throw blanket (sold-out at Nordstrom but similar throws are here and here). While many people do “spring cleaning”, some of us do “summer cleaning” as well. If you were too busy this spring and want to jump into some summer cleaning, I highly recommend it as some of these things are important to do monthly. 1- Dust and wipe down your light fixtures. 2- Vacuum dust from headboard or wipe down if your headboard is not upholstered. 3- Vacuum mattress and then use steamer to kill any dust mites. Do the same to your lamp shades. I do this quarterly. 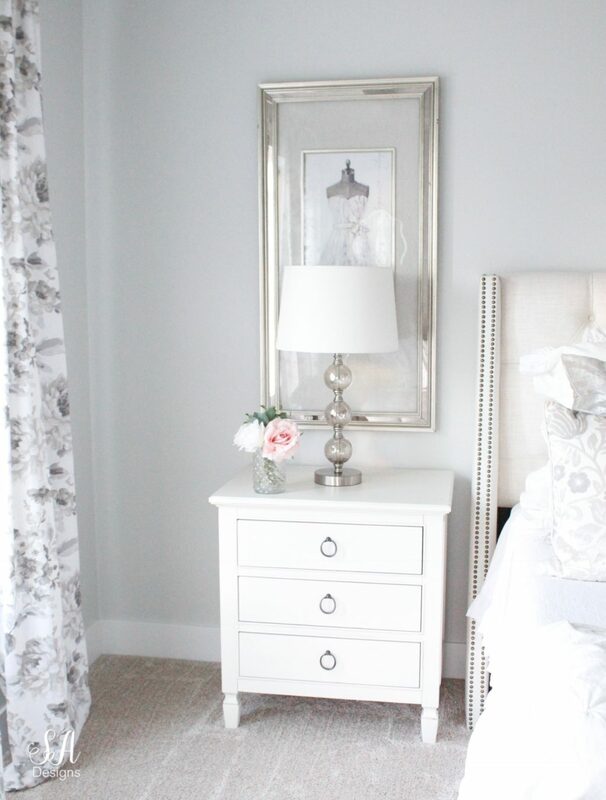 4- Switch out your linens for fresh whites to brighten the room. Fold down heavy duvets or quilts. 5- Change out throw pillows and throws. If you have a neutral room, throw in a fun pop of color for the summer. 6- Switch out your art and/or accent pieces. 7- Add some fresh or faux florals around the room. 8- Clean any area rugs. It’s by Skyline Furniture and we originally bought it HERE. The color is called “Linen Talc”. You can also find it HERE and HERE. That pretty pink vase looks pretty over on my vanity too. I’ve added hints of blush for the summer by adding a plush blush pillow on my vintage chair (that chair was one of my favorite garage sale finds back in Waco, when we lived there, and I had it recovered), blush faux roses in my vase on my dresser instead of white, and even left out my Gucci crossbody bag on my vanity. I wanted to show you my chaise lounge and dresser too BUT forgot to take pics (blonde moment) and just got back from an early 40th Birthday trip with my hubby so I’ll share that in another post later. OR I’ll just update this one so check back! Please visit my other talented friends below who are sharing their summer decor in their homes today! They are so inspiring and never disappoint! So pretty and glam…it really reflects your personality Summer! I absolutely love your style, Summer! So elegant! Your bedroom seems like the perfect cozy getaway spot. 🙂 I hope you’re having a wonderful week! So lovely and elegant, Summer ! I absolutely love your whites and creams and pops of light blush And your tips for summer cleaning are perfect! So glad you could be part of this summer series tour! I love your bedroom decor! All the little pops of blush pink are so pretty! I LOVE the simplicity ofthe large fewer pillows on your bed. So gorgeous! Also the drawer for smartphones is genius! Can you please share the beautiful flower pillows on the bed? 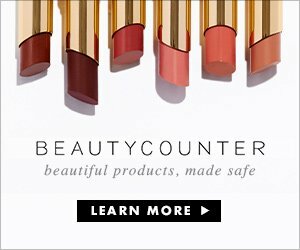 Love the pretty addition of blush, so beautiful. Such a lovely bedroom. I’m certainly staying tuned for the update. Your bedroom is heavenly, neat and welcoming. Thanks for the tour and sharing your beautiful ideas with us. You have great taste. I'”d love to know where you got the prints above the night stands. Love reading your blog. The updates are beautiful. Thanks for sharing this amazing Post.